An exciting tree-top tourist attraction at Coombe Abbey is set to swing into action as its official opening date has been revealed. Go Ape at the popular beauty spot will be having a grand opening on Saturday, April 6 and adventurous members of the public will be able to put it through its paces. Work began on the new site at the start of March and contractors have been busy getting everything in place and everything is progressing on schedule for the opening. Richard Harrison, Managing Director of Coombe Abbey Park Limited, who operate the hotel and cafes within the park and have partnered with Go Ape on this project, is thrilled that it will soon be open. Go Ape is going to be a fantastic asset for the Coventry and Warwickshire region and we are very proud that Coombe Abbey is working in partnership with the Go Ape team on this project,” he said. “We’re very excited to see the site opening soon and welcome everyone along to see the team and all the hard work they have been putting in over the past few weeks. Located within the park, the attraction will feature The Plummet, a 12-metre free-fall vertical drop, a dual Tarzan Swing and a 200m double zip course finale. Andrew Walster, Director Streetscene and Regulatory Services at Coventry City Council, said: “Coombe Park has a special place in the hearts of local people – and now it has an attraction to get hearts pumping too. 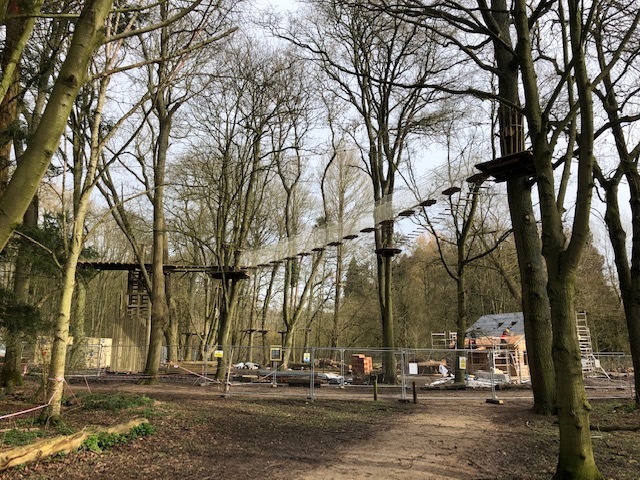 Luke Parker, manager of the Go Ape site at Coombe Abbey, added: “The platforms are in place, staff have been fully trained and we are just putting the finishing touches to the site. Go Ape at Coombe Abbey will be open between 10am and 4pm Monday to Sunday. For further information about Go Ape visit the Go Ape website.